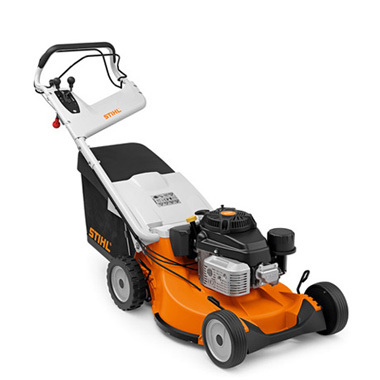 The STIHL RM 756 GC petrol lawn mower has been specially developed for tough, long-lasting use in professional operation. With its 54 cm cutting width and its 3-speed gearing, this professional lawn mower masters extensive lawns on large plots of land with ease. Your comfort while working is ensured: The hybrid housing impresses with its sturdiness and durability. 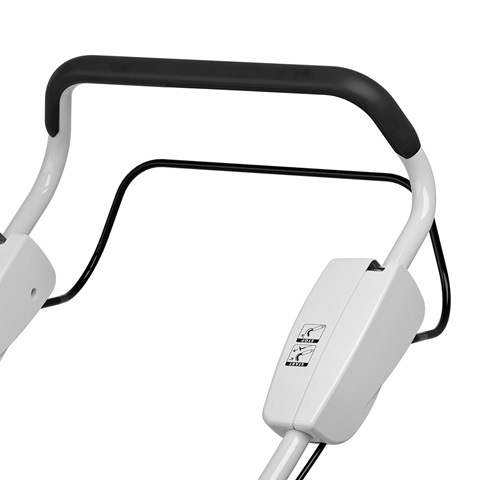 The fold-down mono-comfort handlebar can be adapted to your body height and ensures ergonomic working. This model features anti-vibration elements which effectively reduce engine vibration. With the aid of the foldable handlebar, the RM 756 GC can be transported and stored in a space-saving manner. 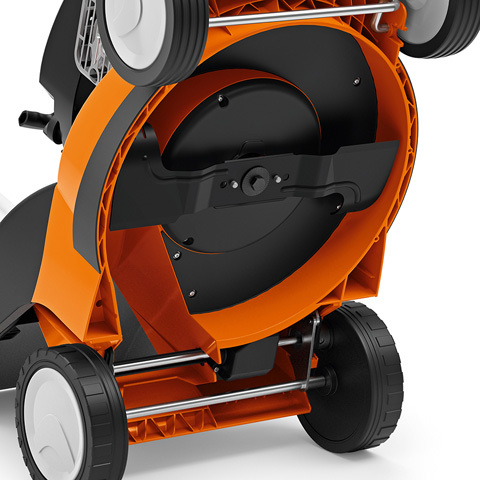 Thanks to the blade brake clutch, the lawn mower can be moved using self-propulsion with the blade stopped and the foldable 80-litre grass catcher box can be emptied without restarting the engine. 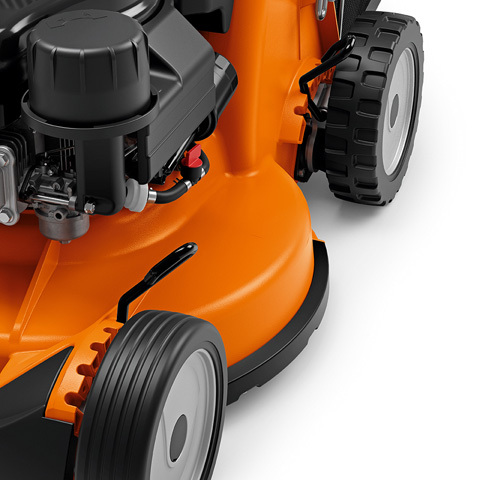 And as is fitting for a professional machine, the cutting height adjustment of the mower can be set at each wheel to achieve precise lawn heights. 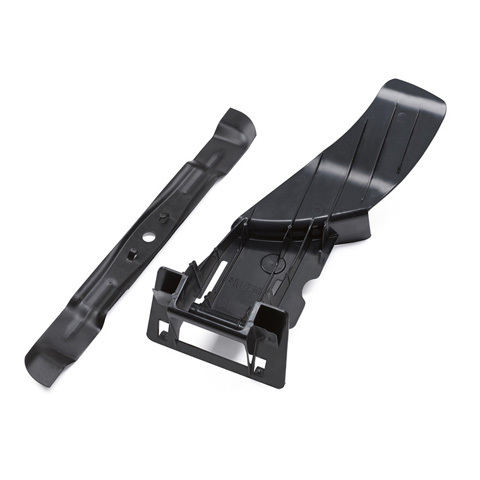 Damage to the housing is prevented by means of the front impact protector. It provides protection during start-up on stony ground or path borders. It can also be used when lashing the STIHL lawn mower during transport. The powerful Kawasaki engine with large air filter is particularly high-torque, smooth-running and durable. The highlift blade provides for an evenly cut lawn and ensures optimal filling of the grass catcher box. The blade generates a strong air current in the housing, which makes the grass stand upright before cutting and efficiently conveys the clippings into the catcher box using an integrated and powerful air flow system. 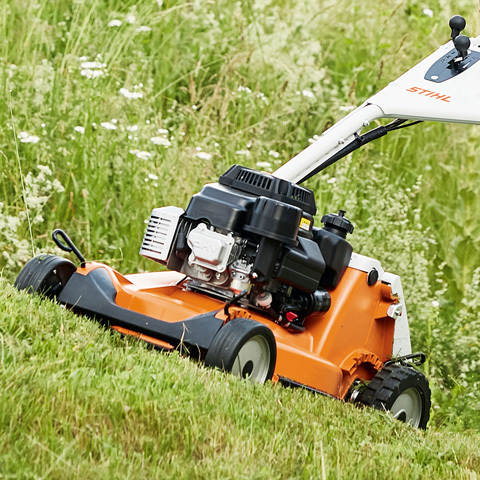 The 3-speed gearing of the STIHL lawn mower enables comfortable mowing. The drive speed can be controlled by means of three forward gears. The blade brake clutch disengages the blade and engine to protect the crankshaft. It makes it possible for the grass catcher box to be emptied without restarting the engine. 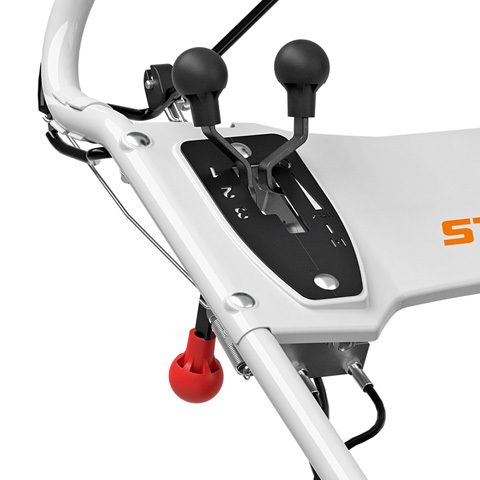 Further comfort feature: The machine can be moved using the self-propulsion with the blade stopped. 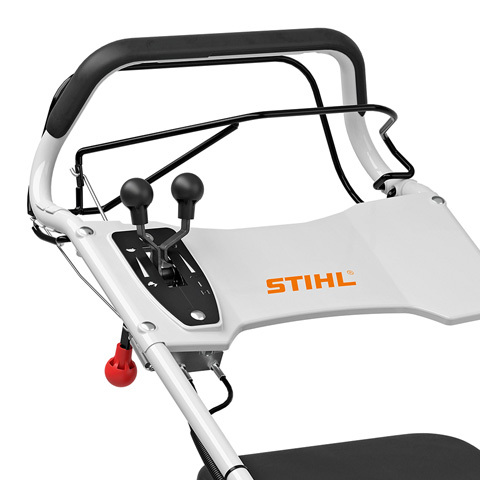 Particularly ergonomic and pleasant handling is ensured by the super-soft grip of the STIHL lawn mower. With its 80-litre capacity, the resilient fabric grass catcher bag is particularly suited for mowing large lawns. It can be comfortably folded together and is equipped with anti-dust protection. 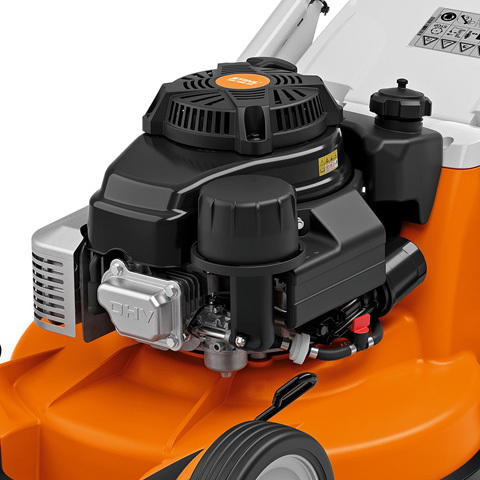 STIHL lawn mowers featuring a sturdy hybrid housing are characterised by their particularly light weight and durability. 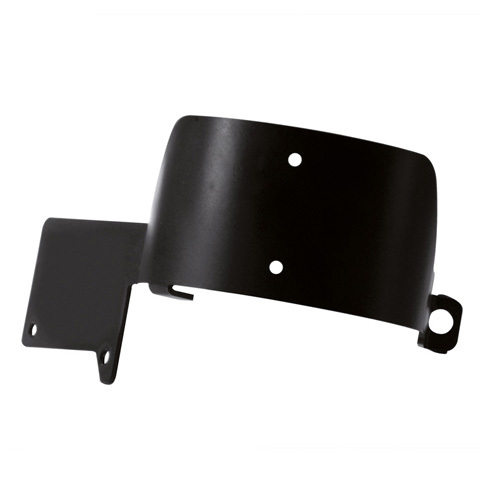 These are ensured both by the outer housing made from magnesium with scratch-proof powder coating as well as the inner housing of impact-resistant polymer. 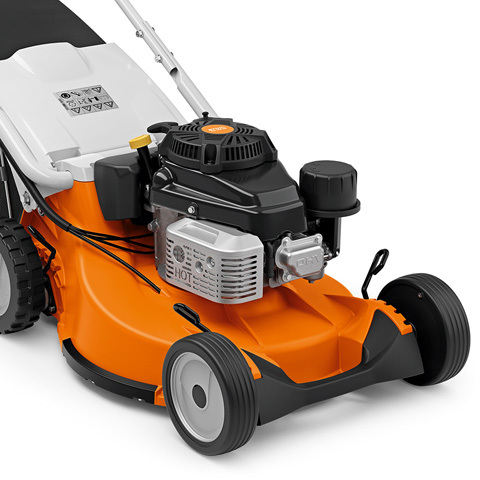 The integrated vibration damping ensures smooth running during mowing. 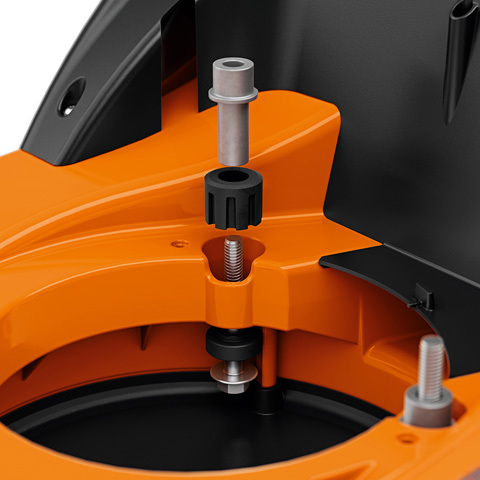 This special device protects the air filter of the 7 Series STIHL lawn mowers from impacts. 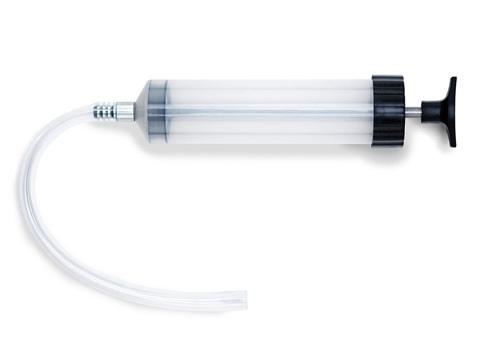 The guard ensures a particularly long service life and is suitable for models with a cutting width of 54 cm.